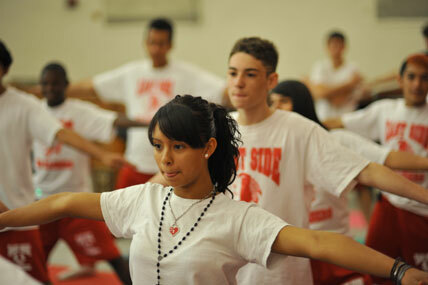 Howard Best, photographer for Newark, N.J., Public Schools, took this photo of students at Newark's East Side High School in a yoga class as part of the city's “Let’s Move! Newark: Our Power” fitness campaign. Howard Best, photographer for Newark, N.J., Public Schools, took this photo of students at Newark’s East Side High School in a yoga class as part of the city’s “Let’s Move! Newark: Our Power” fitness campaign. As part of the four-month program, launched on Oct. 5, about 1,500 freshmen at four of the district’s largest high schools, including East Side, will be encouraged to wear a monitoring device that will light up bright green when an hour of physical activity has been completed. Students may wear the devices to measure brisk walking, exercises, and sport activities at home and in school. The devices will be set to measure activity levels that reach 25 minutes during a 30-day time period; 50 minutes during a 60-day time period; and 75 minutes during a 95-day time period.